Walk down the laundry detergent aisle in any store, and almost every single bottle, box, and the bag has a little symbol on the label: the letters "h" and "e" separated by a red dot on a field of blue surrounded by a white circle swirl. 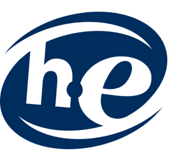 The HE stands for high-efficiency laundry detergent. What Is High-Efficiency Laundry Detergent? Any laundry detergent or laundry product like stain removers, boosters, and fabric softeners with the HE symbol are formulated to be used in high-efficiency washing machines like front load washers as well as top load washers. High-efficiency washers use much less water than an older standard washer. The HE detergents are developed as low-sudsing and quick-dispersing cleaners for use in low water volume machines. The HE detergents are formulated to hold soil in suspension in that lower volume of water, so it is not re-deposited onto clean clothes. Why Do I Need to Use a High-Efficiency Laundry Detergent? Most Americans grew up using a standard washer that pulled nearly 40 gallons of water through a load of laundry during the wash and rinse cycles. The detergents that were used produced lots of bubbles because manufacturers thought that lots of suds meant the clothes were getting clean. Fortunately, the washer used enough water to rinse away all those suds. Even the newer standard top load washers use around 27 gallons of water to handle detergent/soil residue. However, high-efficiency washers use only 11 to 14 gallons of water. Using a traditional laundry detergent in a high-efficiency washer will produce too many suds that will not be fully rinsed away. Excess suds will interfere with the tumbling action used to clean clothes in both types of high-efficiency washers. The use of traditional detergent with lots of suds can also cause the washers to leak, damage the electronic system of the washer, and may void the manufacturer's warranty. The use of traditional detergents in HE washers also contributes to the growth of mold and the odor that can linger in the washer. There isn't enough water used in each load to wash away all the suds and the soil they contain. The sticky combination may cling to the washer interior and become the perfect breeding grounds for mold that causes odors. How Much High-Efficiency Laundry Detergent Should I Use? For a normal size load of laundry, you need only one to two teaspoons of high-performing high-efficiency detergent. Use only one or two single-dose detergent units per load. One is sufficient unless the load is heavily soiled or super large. If your high-efficiency detergent is not getting your clothes clean, do not simply add more. Overdosing only leads to more problems like stiff and scratchy fabrics, trapping of odor bacteria and streaks from the redepositing soil. Instead, switch to a better quality detergent. Yes, it will cost more, but you can use less and avoid re-washing clothes. Most high-efficiency washers have automatic detergent dispensers. Read your washer's care and use guide on how to fill the dispensers. If you have lost the guide, you can find it here. Most will accept either powder or liquid detergents. Never mix the two in the same dispenser because caking and clogging can occur. If you choose to use single unit detergent packs, those should be placed in the empty washer drum before adding the dirty laundry and water. Never place a laundry pod in a dispenser. Can I Use High-Efficiency Laundry Detergent in a Standard Washer? If you still have a standard washer and picked up a bottle labeled with the high-efficiency symbol, you can use the high efficiency in a traditional top load washer with no problems. You won't see lots of suds, but your clothes will still be clean. Use no more than 1/4 cup HE laundry detergent in a standard washer for a normal to large load. This is useless if the load is lightly soiled or smaller.